At Comfort Services and Repair, we are passionate about providing our customers with world-class customer service, skilled workmanship and competitive pricing. have been with our company for generations. That's loyalty-and that's the COMFORT SERVICE AND REPAIR difference! Comfort Service and Repair, We are your one stop for all of your HVAC repairs, sales, replacements and new installation. With over 70 years of combined management experience. We feel confident that we will have the best solution for all your residential and commercial needs. Our technicians are highly trained & certified to assess and repair as well as replace all types of a/c & heat pump models. Regardless if its old or new. 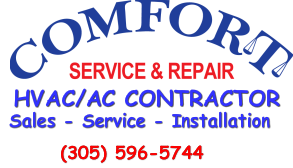 Comfort Service and Repair, is a fully Licensed and Insured company, proudly providing service throughout the South Florida area. We value your business and strive to always keep our prices competitive while keeping your best interest in the forefront of our business. OUR STAFF MAKES A DIFFERENCE! TO ALL OF OUR STAFF & CUSTOMERS.. THANK YOU, WE APPRECIATE YOU! Call us anytime to schedule your Service! 305.596.5744 We service all makes and model!